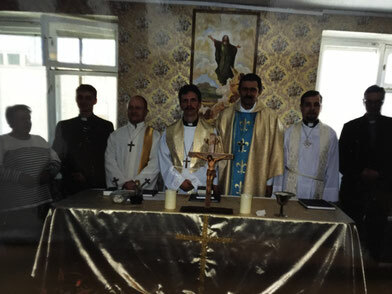 The St. John Evangelical Lutheran Congregation was established in 2001 in Saratov by the blessing of His Eminence Bishop Dr. Arri Kugappi, head and bishop of the Evangelical Lutheran Church of Ingria for the terrirory of Russia. Currently, the congregation has a chapel in the very center of Saratov. The chapel is named after St. John. This chapel was dedicated by the Bishop Arri Kugappi on April 30, 2006. The Senior Pastor of our congregation is Pastor Olav Panchu. St. John Lutheran is a traditional confessional congregation in Saratov and is a member of the Evangelical Lutheran Church of Ingria (ELCI) which is one of two historical Lutheran church bodies of the Russian empire. We follow the Finnish and German traditions. Historically, our church has three levels of ordination: deacon, priest and bishop. ELCI is one of the oldest Lutheran churches in Russia. The historical center of Russian Lutheranism is in the city of St. Petersburg in northwestern Russia. We have two priests and two deacons in our congregation. Some of our ministries include social services, missions, deacon services, Sunday school, a club for young people, a women's group, and an accomplished church choir. Our congregation is very active in the city and province of Saratov. The level of the head of the congregation we are the members of the religious board appointed by the Governor of the province. We have a very good relationship and communication with the government of Saratov State, the administration of the city of Saratov, the Russian Orthodox church, Saratov State University, and police drug prevention unit. Our congregation also respects the laws and constitution of the State of Saratov and the Russian Federation. According to old Lutheran tradition, we have the main worship service with Holy Communion every Sunday at 10:00. Week days the staff works in the pastoral office. We also have confirmation classes and Bible school. We invite you to worship with us and to become a part of God's family in this place!